When you truly love a spirit, it's important to know as much as possible about it, or at least be able to effectively BS about it. And no liquor has the ability to draw out quasi-experts more than whiskey. In an effort to help better your BS, we offer up this handy guide to the best-known forms of whiskey, arming you with the knowledge you need to pretend you know what you're talking about. What it is: Kentucky's greatest contribution to mankind -- with respect to the Colonel -- came into our lives in the 18th century. It legally must consist of 51% corn and be aged in virgin barrels at least 2yrs, and hovers between 80 and 101 proof. It tastes like America. Where it comes from: The Bluegrass State is the most genuine, though microdistillers all over the country are starting to make what they call bourbon, typically in barrels shipped from Kentucky just to trick you. Great examples: Buffalo Trace, Maker's Mark, Bulleit, and Wild Turkey. Distinguishing qualities: An oakiness from the barrel, and notes of vanilla. Best cocktails: Get it in a Manhattan or an Old Fashioned. Or stop being a putz and just put ice in it. 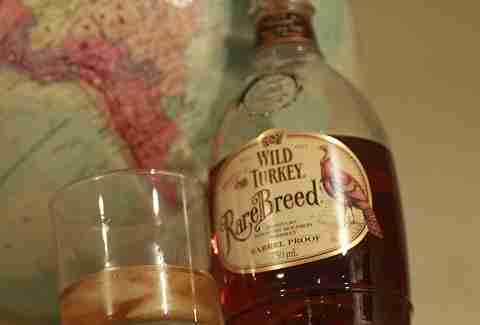 What it is: Essentially, it's not all that different from bourbon. The main difference is that if you call it "bourbon", you will likely be shot by an angry country singer. Also, it's treated to something called the Lincoln County Process, which involves dripping it through charcoal. Where it comes from: One of the scattershot counties in Tennessee that actually allows alcohol. Because Tennessee be CRAZY. 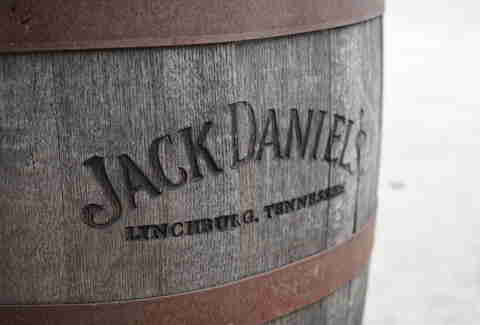 Great examples: Jack Daniel's and his classy brother, Gentleman Jack. And his yahoo cousin George Dickel. Distinguishing qualities: A bit mellower than its Kentucky kin due to that charcoal action, and a little more sweetness under the bite; ability to make 4H chicks look way hotter. Best cocktails: Whiskey sour. Also, Jack & Coke isn't just a clever name. What it is: More rules! 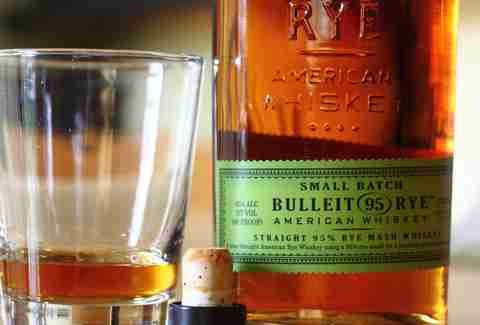 In order for rye to be rye, it needs rye. Go figure. The mash has to be more than half composed of rye, in fact. Otherwise, it's a lot like a drier version of bourbon. Also, rye. 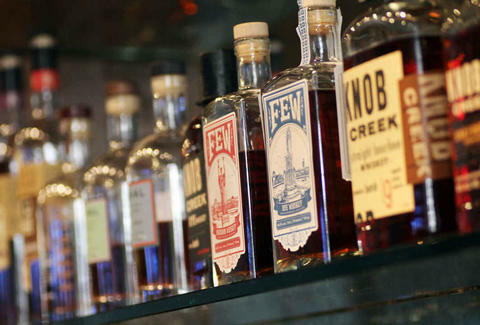 Where it comes from: Generally, Kentucky, since a lot of your favorite bourbon distillers also dabble in rye. They also, interestingly, make it at George Washington's crib, Mt. Vernon, presumably to dull the pain of chewing with wooden teeth. Great examples: Jim Beam and Van Winkle Family Reserve. Distinguishing qualities: Rye slaps bourbon's relative sweetness in the face, offering up a rougher, stick-in-your-throatier flavor that's a lot spicier. Also, you don't get much more distinguished than being made by George Washington. Best cocktails: Classics like Sazeracs and Manhattans are completely transformed if you sub rye for bourbon. What it is: The most misunderstood whisky, for which every man at some point feels he needs to develop a taste. It's a malt whiskey (though it can be grain) that's all about the aging; it's gotta sit in a barrel for at least 3yrs. The longer it sits there, the tastier it is. Then there's the difference between single malt and blended: this can get really confusing, since single malt can be a blend of whiskies as long as all of them are from the same distillery. Blended, meanwhile, can mean your bottle is the product of multiple distilleries. Confused yet? Just drink up. Where it comes from: The Highlands of yore. Great examples: Glenlivet, Glenfiddich, Glenmorangie, and other Glens with weird names… Johnny Walker, Balvenie, and other stuff in your boss's office. Distinguishing qualities: That smoky "old man" flavor that people love, which is actually peat, and intense wood and floral notes that change with each passing moment in the barrel. Best cocktail: No. Don't even think of it. Unless "on the rocks" counts as a cocktail. What it is: Also known as "water" in Dublin, Scotch's neighboring spirit is extra smooth thanks to its lack of peat and typical triple-distilled preparation following 3yrs in a cask. 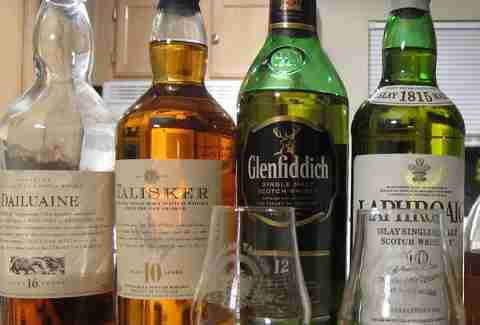 It's often blended, usually single malt, and one of the most popular whiskies in the world. 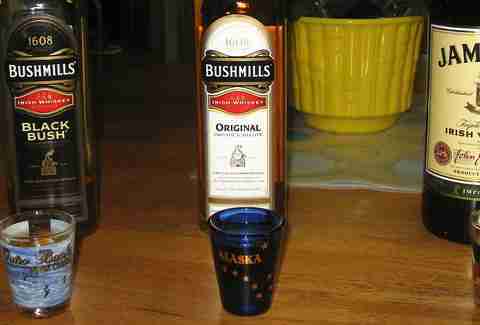 Where it comes from: The Emerald Isle, or a ginger who showed up at the party and seemed to pull a bottle out of thin air. Great examples: Jameson, Bushmills, Redbreast, and Locke's. Distinguishing quality: A smoothness that makes Scotch seem like drinking sandpaper by comparison, in addition to a marked sweetness. Best cocktail: Odds are you've done a carbomb at some point. It also makes a hell of a sour, and an Irish coffee. What it is: America Junior's take on whiskey is often called "brown vodka" by whiskey snobs, but most of them don't know what this stuff's all aboot. It's actually a blend of liquors based on corn and other grains, which makes it a lot lighter most of the time. And while some of the quality is questionable, it warms you up. That counts for something. Where it comes from: We have absolutely no idea. Upper Michigan? 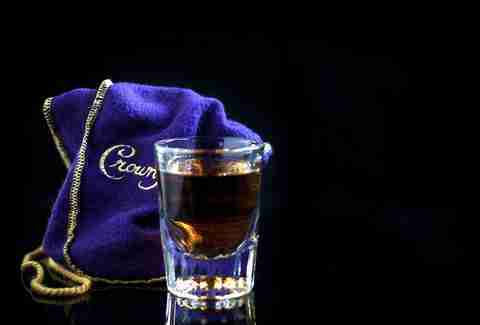 Great examples: Crown Royal (and its uber-Canadian maple flavor), Canadian Club, Canadian Mist, and Black Velvet. Distinguishing qualities: Generally much lighter than other whiskies, which can make it seem slightly watered down until it hits you; big rye notes and pronounced caramel. Best cocktails: Drop it in ginger ale and slug it back. What it is: It's not made with rice, despite some misinformation out there. In fact, the biggest Japanese distilleries are shelling out something remarkably close to Scotch: single-malt and blended whiskies with a Western influence. Where it comes from: Throughout the Land of the Rising Sun, with Suntory's Hakushu distillery claiming status as the highest-altitude distillery in the world. 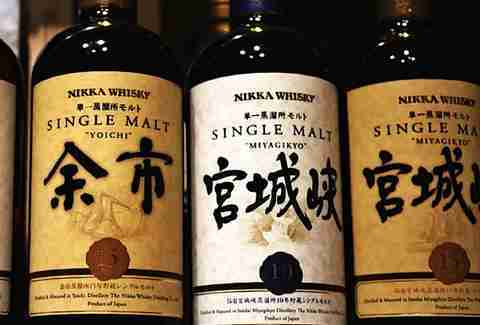 Great examples: Hakushu 12, Yoichi, and Taketsuru. Distinguishing qualities: As they are prepared like Scotch, each batch has a different quality, but there's a universal crispness to these spirits matched with a delicate sweetness. Best cocktail: Just add ice and prepare to be surprised. Andy Kryza is Thrillist's national eat/drink senior editor, and owns a fine collection of whiskies comprised solely of little airplane bottles. Follow his escapades decline via Twitter at @apkryza.